From functionality to style, there are many things to consider when choosing a garage plan for your backyard. Furthermore, there is a vast array of garage designs to choose from. These quick tips will give you the insight you need to select the best design for you. One of the first things to determine is what size garage you will need and if it will fit in the available space. Knowing the dimensions of your lot/usable space will help you find a garage with the right width and depth. You wouldn’t want to start building only to discover the garage is much too wide and will extend over your property line. Consider a tandem garage for a long and lean lot or a two-car garage with storage loft when you are in need of extra storage but are working with limited space. How do you plan to use your garage? Parking? Storage? Workshop? Garden shed? Knowing how you will use the garage will help you compare various options. If you need to park two cars, a single-car garage will not work. If you need a place for the family cars and room for the riding mower, the recycling containers and the kids’ bikes, skateboards and helmets, a three-car design will provide ample space. Do you need a place to store tools, lawn and garden equipment, and outdoor toys? Do you need room for a workbench? Depending on how you plan to use the garage may determine what size garage you will need. Determining the function of your new garage may influence the special features that you’ll need. Garage plans have much to offer from the drive-thru styles with front and rear overhead doors to those with finished living space. Will you need a full or half bath for easy clean-ups after dirty outdoor projects? How about laundry facilities? A mud sink? Would a workshop satisfy woodworking and craft needs? Maybe you’d like a workbench or storage closet. Do you need a storage loft? Perhaps an office would work well for a home based business. 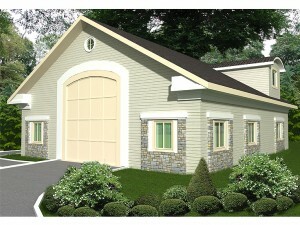 If you need additional living space or would like to earn extra income a garage apartment plan is a good solution. Many offer living space, compact kitchens, full baths and a sleeping area. Now think about your home. Do you want a garage that has the same architectural style or will a simple design with a gable roof do? Will the garage be visible from the roadway? Should it have decorative exterior elements that complement your home? Garage plans come in a variety of styles from a basic design to plans with all the decorative frills ensuring you’ll find one that blends seamlessly with your home. Choosing the perfect garage plan is no easy task. So, take time to think about these elements and decide just what type of garage your family needs. A little thought and effort now will save you time and headaches later.